Freshly back from my big Oregon trip and starting to process photos from the Nikon. Got this one while kayaking in Hosmer Lake in the Deschutes National Forest. A mallard and her ducklings swam in front of the kayak, so I tossed the telephoto lens on my camera and tried to get some shots isolating the mom and one or two of her babies. This one turned out best. Camera & Settings: Nikon D5100, Nikon 70-300mm telephoto lens at 300mm, 1/400 shutter speed, f/8, ISO 125. 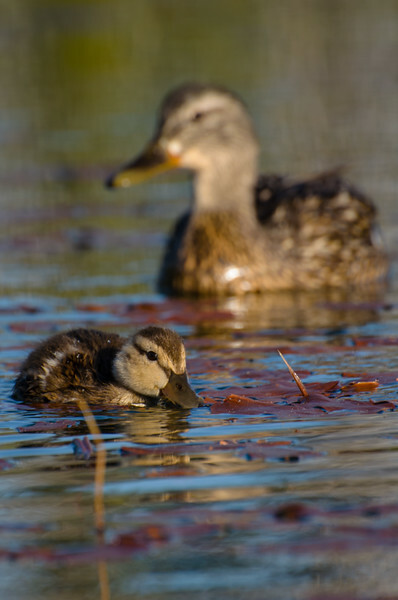 I shot in RAW and processed in Lightroom, cropping away about 25 percent of the image to better focus on the ducks. Even with the telephoto lens, I had to keep my distance to get the shot. Below is the second-best shot but that stick in the water on the lower left of the frame bugs me. The duckling was too far in front of the duck to get both in sharp focus without a tripod, which was impractical in a moving kayak with moving subjects. I wish I had drifted a little more right, which would have perhaps gotten that awful stick out of frame.